If you’re looking at the CBO for accuracy, you’re looking in the wrong place,” White House press secretary Sean Spicer said Wednesday. Since Mr. Spicer’s BA is in government rather than economics, I thought it useful to consult some documentation based on quantitative assessment. 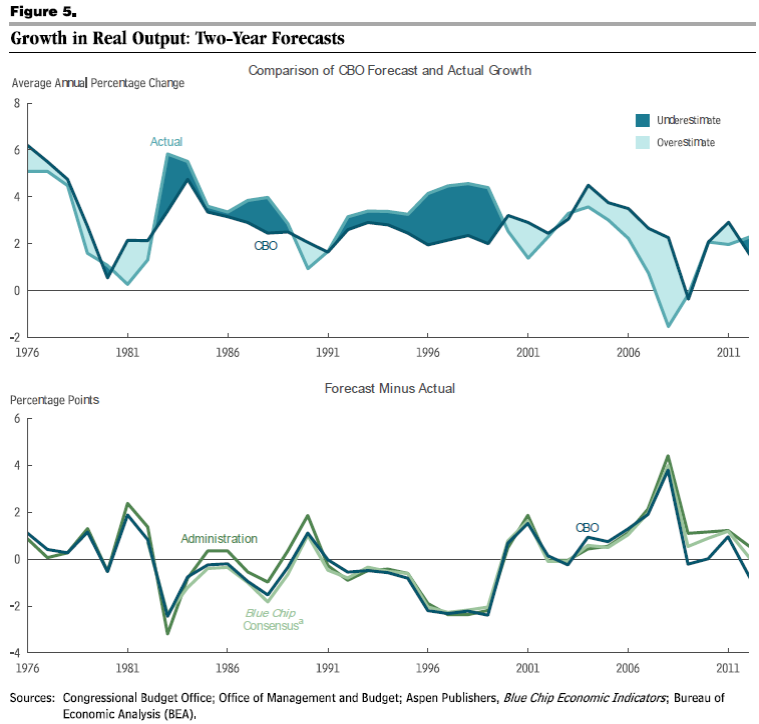 Here are three graphs from CBO, “CBO’s Economic Forecasting Record: 2015 Update,” February 2015. Source: CBO, “CBO’s Economic Forecasting Record: 2015 Update,” February 2015. Source: Excerpt from Summary Figure 1, in CBO, “CBO’s Economic Forecasting Record: 2015 Update,” February 2015. Source: Excerpt from Summary Figure 2, in CBO, “CBO’s Economic Forecasting Record: 2015 Update,” February 2015. Overall, mean bias in CBO’s two year projections is pretty small for GDP, nominal GDP growth, and inflation. Root mean squared errors (RMSE’s) are comparable to Blue Chip forecasts (and a little smaller than OMB), which is pretty remarkable given (1) CBO projections are conditioned on current law, and (2) Blue Chip forecasts are the averages of individual forecasts, and averages of forecasts are typically more accurate than single forecasts. I’m not sure who Mr. Spicer believes would provide better forecasts. Since, as in many other instances, he has not provided additional information, we are in the dark in this regard. However, we can be fairly sure with the directive to OMB and CEA to reverse engineer Administration forecasts to hit 3-3.5% growth , OMB growth forecasts will eventually have much bigger RMSE’s than CBO’s. Update, 3/12 10:15am Pacific: For the sake of completeness, here is Mr. Spicer’s boss forecasting the dollar and inflation. This entry was posted on March 9, 2017 by Menzie Chinn. Curiously, Trump said exactly the same thing about the the Bureau of Labor Statistics for the last year, they were fake. Except now Trump says today’s data release is real. Uh, oh. Trump’s director of the OMB Mick Mulvaney has jumped on the tinfoil crazy man bandwagon. He also claims that the BLS has been creating “fake” statistics, except for this month. Is there anyone in this administration who is not infected with conspiracies? Obama is not a US citizen. The election was fixed — up until the point that Trump won. The NY Times manipulated photos to conceal the fact that Trump’s inauguration had millions more people than reported. Trump would have won the popular vote if 3 million people had not voted illegally. Trump would have won New Hampshire if thousands of people had not been bused from Boston to vote illegally. The BLS has been putting out fake statistics every month — except for this month. Former President Obama is a felon who wiretapped Trump’s phones. “Deep State” is sabotaging Trump. What have I missed? These are the ravings of a mentally unstable paranoiac. notice how there is no outrage from the likes of rick stryker, peak trader and bruce hall regarding these issues? the right has accepted the use of lies and deceit, now in the open air, to advance their agenda. I think, liberals are driving Trump, who use to be a democrat, further and further to the right with their vicious attacks. Liberals should be happy Ted Cruz didn’t win. And, I think, more and more moderates are rejecting liberal behavior. Trump is well aware there’s a concerted effort to delegitimize and discredit him. I think, it will continue to backfire on the liberal establishment. Afterall, policies are what’s most important. i thought conservatives were after strong communities, integrity, honesty. apparently, even if we have to lie to get there, it is ok with conservatives..
peak, i did notice after being called out on the support of deceit, you did nothing to challenge the behavior of the trump administration. no outrage. but you did try to blame him on the democrats. not surprising, since you tried to do the same thing with the criminal behavior of the financial folks during the financial crisis. A lot of conservatives didn’t vote for Trump or held their nose and voted for him. Trump also ran against the Republican establishment (Romney and the Bush’s, for example, didn’t vote for him). And, I stated before, criminals or criminal behavior should be punished (regardless of party affiliation). Unfortunately, liberals don’t seem to mind electing and reelecting criminals or criminal behavior, along with enacting dumb policies. statements like this are why you are considered a hack, peaktrader. Baffling, I didn’t hack anything. Saying liberals are more politically active, for example, doesn’t make me a hack. Baffling, there’s evidence to support my statements. peak, there is no evidence other than your use of the terms “I think”. but you seem to “think” your opinions are facts. not surprising. same thing in the world of trump. but your opinions are not fact, peak. and that is why you are a hack. People are discrediting Trump? Ha. Trump is discrediting himself. Look at that list of crazy conspiracy theories above that Trump believes. The man is mentally unstable. Like the Emperor with No Clothes, people are too polite or too afraid to say it. But that is beginning to change. He can’t prop up the facade forever. To conclude Trump is mentally unstable based on his statements is crazy. There’s either some truth or rational reasons why he makes those statements. PeakTrader: You mean like his assertion more people attended his inauguration than Obama’s first? Or that Frederick Douglass is doing an amazing job? Menzie Chinn, Trump has good reasons to believe the media hasn’t been fair and try to belittle him. Trump wants the black vote. Trump sometimes overcompensates when attacked. It’s all part of the war on biased reporting. PeakTrader: So the clearly wrong statement that the inaugural crowds were larger for Trump ’17 than Obama ’09 was rational? I think, Trump saw a bigger crowd than the media reported or showed, and Trump believed it was huge. PeakTrader: So to assert that the media was distorting the photographs, without any proof, was rational? It’s rational for Trump to assume the media would underreport the crowd and use that against him somehow. PeakTrader It’s rational for Trump to assume the media would underreport the crowd and use that against him somehow. The only sense in which this is rational behavior is if Trump believes his base is so stupid and uninformed that they won’t notice he’s lying…or won’t care. In other words, it’s only rational to make wild and obviously falsifiable statements if you believe your audience will let you get away with it. And who knows? Trump might be right about that. I do see a fair amount of evidence that Trump’s base is tribal, unhinged, ignorant and disproportionately low information voters. Most Presidents care about their historical legacies. Not Trump. He’s an old man (and as we now know, taking a lot more cardio/blood/arterial plaque medications than first reported) who believes people will love him even if he shoots someone in the middle of NYC. So maybe he doesn’t care what history says about him. The good news for James Buchanan and Andrew Johnson is that Trump will become their new floor. Worst President ever. If you voted for him you should be ashamed. And you owe everyone an apology. 2slugbaits, I think, Trump’s base, which include moderate democrats and fewer republicans, are as much against the media as Trump. I doubt that makes them stupid or uninformed. Trump seems to be in great health for his age. Almost everyone has underestimated Trump, particularly the liberals. Would you’ve been happier with a Cruz Administration? The good news for you is we’re entering the eighth year of the expansion, this year, and there may be a recession before the 2018 elections. Can you do the same graphs with their Obamacare projections?